Our meal planning app is brimming with features to help you plan faster, shop more easily, and deal with real-life eating restrictions. Each week, Real Plans generates a completely personalized meal plan that’s based on your family size, dietary restrictions, and preferred schedule. We also make it easy to shuffle things around, swap recipes in and about, and generally dial-in your plan to keep up with the chaos of everyday life. All of our recipes are kitchen-tested, and family-approved by picky eaters and people with a wide range of dietary restrictions. We are foodies too, so you’ll find our recipes are scrumptious AND nutritious. 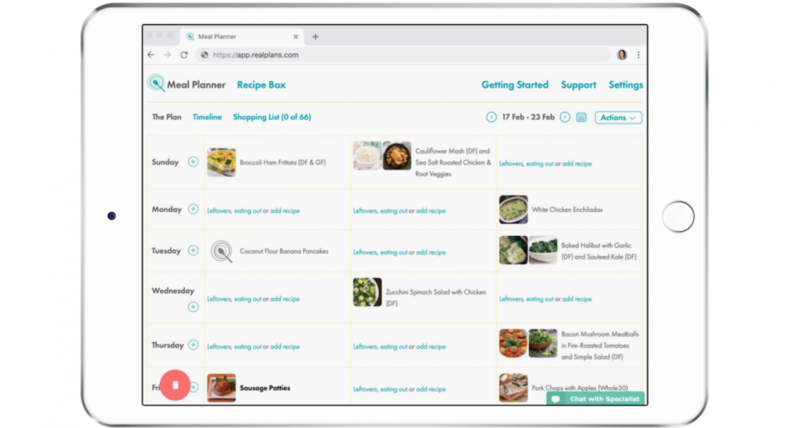 Real Plans can pick recipes for your weekly meal plan automatically, but if you’re looking for something specific, our comprehensive search engine lets you search recipes by diet type, ingredient, course, season, cuisine, prep time, total time, meal size, and even cost. Real Plans makes it easy to import recipes from almost any recipe site by simply pasting in a URL. We’ve also got a handy chrome extension so you can do it with one click. With Real Plans you can tweak any recipe to just your liking, whether you want to add or remove ingredients, mess with proportions, or even rework the instructions. You can also mix in your family’s favorite dishes by adding your own recipes to your Real Plans recipe box. Got a kid in gymnastics on Monday nights and another at piano lessons on Wednesday? With Real Plans you can quickly adjust the number of servings for any meal to perfectly match your family’s schedule. We use Real Plans for our own families every week, so making it easy to use is our top priority. However, if you’ve got questions, our meal planning specialists are available to chat live. Just click the “Chat” button at the bottom right corner of this page. You can send an email to support(at)realplans.com if our chat team is not currently available. Real Plans’ smart shopping list streamlines all the ingredients you need to make your weekly meal plan, saving you the time and hassle of handwritten lists. You can check off items you already have in your kitchen and easily add items that aren’t part of your meal plan – like toilet paper or cat food. You can even tell the list to buy almond milk or baby carrots every week. Or ask it to stop telling you to buy salt – since you always have it. Your shopping list is organized just like your grocery store to make shopping fast and easy. Or if you’d prefer, hit a button and have it all delivered in as fast as two hours from Instacart! The Timeline is a helpful tool that tells you what you need to do and when you need to do it to get your delicious, wholesome meals on the table. In the timeline, days are divided into four segments, and each segment includes just those instructions from your weekly recipe cards to do at that time on each day. You can modify Timeline instructions on Real Plans recipes to suit your specific needs, such as thawing something the night before instead of the morning of. Every Real Plans recipe has detailed nutritional info to help you stay on top of your diet including calories, fat, cholesterol, sodium, and more. Our meal planner also features an optional macro tracker that automatically tallies up your calories, fat, carbs, and protein so there’s no math necessary. Learn more about the Real Plans + Macro Tracker. Real Plans is fully functional right in your web browser, or you can use our dedicated mobile apps for both iOS and Android. No matter which type of device you’re on, you’ll have complete access to all of your weekly plans, shopping lists, and recipes. Real Plans meal planning app isn’t just packed with great features you can use. It also has the power to help you shop with confidence, embolden picky eaters, and renew your enthusiasm for cooking. But don’t take our word for it! We invite you to see testimonials from our users who have already taken their meal planning to the next level with Real Plans.